Summer weekends is when most LFYC members get to do their sailing, and that’s why we really don’t know Lake Forest’s high school sailors very well. Late afternoon into early evening on Monday, Wednesday, and Friday in fall and spring is when the high schoolers sail, and on weekends they’re on the road with coaches and boats to compete in far-flung regattas. Members of the team say that we club sailors sometimes confuse them with the beginning sailors in the summer classes whereas a high school sailor typically has sailed for years, may have been in over a hundred races, and sails in early spring and late fall when most of us find it too cold to be on the water. Making friends is a vital part of the high school sailing program and on a cool October day the LF team makes lunch in the company of new friends from Minneapolis. The Minnesota sailors were in Lake Forest to sail in a qualifying event for the national-level Great Oaks Regatta. Great Oaks is an event for new teams and for teams that have not qualified for national events in the past four years. Lake Forest hosted the event but was not a competitor. High school sailing is a big and growing part of the U.S. sailing scene. The high schoolers down at the lake in Lake Forest are among the 5000 sailors from 465 schools now active in the sport. 100 of those schools have started their teams in the past five years and many of the new schools are in the midwest. Midwestern schools are organized into the Midwest Interscholastic Sailing Association (MISSA), one of seven regional associations forming the national Interscholastic Sailing Association (ISSA) which is the governing body of the sport. There are 22 sailors on the LFHS team which makes it the seventh largest midwest team. High school sailing in the midwest is a very coed activity and 8 of Lake Forest’s competitive high school sailors are girls and that’s average for the Midwest where 40% of all sailing team members are girls. After gathering for an instruction period, the team will launch boats and put it’s lesson to work out on the water. Although high school sailing started in Lake Forest only in 1999, the program is recognized as one of the best in the nation. In the 2013-14 school year, the Lake Forest High School was the #1 midwest team for both the fall and spring seasons based on points scored in regattas. And a national single-handed sailing champion was a member of the LFHS team. The Lake Forest High School team has qualified for the national finals in each of the three historic national championship trophies: the Cressy for single-handed sailing, the Mallory for double-handed sailing, and the Baker for team racing. High school teams cooperate freely with one another. Lake Forest had these 15 420s ready to be sailed by some of the 25 teams arriving for the Great Oaks qualifier. Additional boats were brought by teams hosted by the Chicago Yacht Club and Milwaukee Youth Sailing Team. A fourth national championship has been added for 2014, a keelboat event , so the high school sailors have been putting in time with the Sail Program’s Colgate 26 and with the Rhodes 19 gifted to the program by Harry Chandler. It’s not easy to get into one of the national championship events. There are 5000 sailors who want to win one of a very limited number of berths in the races. The 500 midwestern sailors represent 10% of the total competitors so they are allotted 10% of the berths in championship events. The Cressy single-handed championship has 16 berths for full-rig boats and 16 for radial rig boats. Only two of those slots are allotted to midwest sailors. The Mallory double-handed championship has 20 berths with two allotted to the midwest and the Baker team racing championship has 12 berths with just one allotted to the midwest. The new Mendelblatt keelboat championship race will have only 10 berths and only one will be allotted to the midwest. Sailing success for the Lake Forest team is knowledge-based – knowledge of boats, sails, and racing technique taught in white-board talks and land drills at thrice-weekly training sessions led by coaching staff members Brian Pannier and Ian Schappe. Because of the structure of the competition, there have to be qualifying regattas and pre-qualifying regattas to determine who sails for the national championships. That is why the Lake Forest High School team must enter 12 to 15 regattas in the spring season and about 12 in the fall. It means competing in two different regattas on some weekends. It is also why the high school sailing season begins so early that events are sometimes canceled because of too much ice. In the spring the sailors are fighting for a place in the Mallory and Baker trophy events; in the fall they seek to sail in the Cressy or the new keelboat event. Sailing has a central place in the lives of team members, according to team captain Porter. But there is still time for other extra-curricular activities so the members enjoy full high school experiences. A little tape on the mast ? Nothing to do by get it off quickly and get the mast on a boat. Sailors are taught to find solutions and to cooperate with others in solving problems. When summer comes, team members go right on sailing, just not under the banners of their high school teams. As individuals some may compete for the Sears Cup or Smythe Trophy – long-honored junior sailing championships. And during the winter holidays, as individuals, team members may sail in Florida at the Orange Bowl Regatta and in one-design regattas where some may pay fees to have Sail Program coaching. Many high school sailors go on to join college sailing teams and many become summertime sailing instructors. 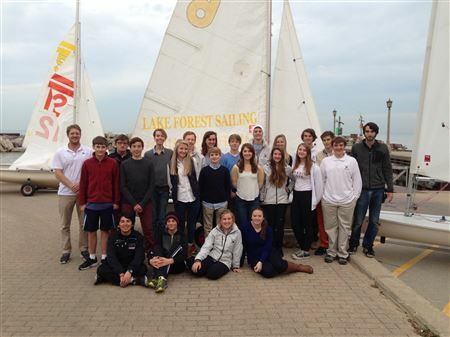 In 2014, eight of the 10 instructors in the Lake Forest Sailing program were former Lake Forest high school sailors. At least five present members of the team hope to sail on college teams. It was a day when LFYC members would stay ashore – temperature in the 40s, gusts hit ing 35 mph – but these sailor will have a positive and safe experience with the coaches who have taught them standing by in their inflatables. Many are expected to be life-long sailors. The goal of high school sailing program is to foster the culture of sailing and to instill a passion for the sport in its young participants. In Lake Forest some of those participants have been stars, of course. Malcolm Lamphere won the 2013 Cressy Trophy for single-handed sailing in a radial rigged Laser; Gordon Lamphere was named to the US Sailing 2014 Development Team. Annie Haeger, ranked world’s number one 470 class skipper by the International Sailing Federation, and a likely member of the U.S. team for the 2016 Olympics, sailed for Lake Forest high school. The coaches have been stars, too. Brian Hill organized and coached the first teams. He was assisted by Billy Yuniack followed by Allison Robin. When Brian left for the banking business, Joey Harris took change with Hunter Ratliff as assistant. Joey eventually moved to the Chicago Park District programs and Hunter moved to the top spot assisted by Brian Pannier. You can see reports of the Lake Forest team’s success in regattas on the internet at regattanetwork.com. Or you can read of its past successes at missa.hssailing.org.